07.05.16 We caught up with long-time Maine chess player J. Paul Ciarrocchi recently at the ChessMaine.net Championship. He was kind enough to grant us this entertaining and insightful interview. We thank Paul for the time and energy over the years that he has dedicated to the promotion of chess in Maine and for granting us this interview. We hope you enjoy it! ChessMaine: Can you tell us how you got started in chess? Did you learn the moves as a child and do you remember your first teacher? J. Paul Ciarrocchi: The 1972 Fischer-Spassky match inspired me to teach myself the moves when I was 24. I played in an unrated tournament shortly afterwards. I did not take the game up again until the 80's when I played against a friend when living in Worcester, Mass. I started playing in rated tournaments there. I continued when I moved back to Maine and joined the chess club at UMO. I was the club secretary for awhile. My only chess lesson from a coach was a rook study taught me by George Cunningham. George was always willing to encourage players. George came to the rescue of the U.S. Chess Federation at one time as acting president when they were in a serious financial and leadership crisis. I had the pleasure of having lunch with George shortly before he passed away. He was quite a gentleman! CM: I understand you have been playing the game for quite some time. Can you give us a summary of your chess "career"? PC: My peak as a player was in that period in the 80's. I had a decent rating and scored some upsets against higher rated players. I won one game against an opponent rated 796 points higher than I was. My best efforts include winning a game against two former Maine State Co-Champions and getting a draw against a 1950 player. My participation after this period became very periodic. When George and Harvey Brimmer passed away the UMO club went into a decline for a long time and there were not many opportunities to play in the area. By the 90's I had returned to school to finish a degree in Zoology and was very involved with competing in and coaching powerlfting. I did play in occasional tournaments but my playing strength and rating went down quite a bit over time. CM: Throughout the years you have met some of the games greatest players. We'd love to hear about your brushes with chess greatness. PC: I have had an extremely fortunate life in getting to meet celebrities through my interests and employment! The most famous player I have met was Tigran Petrosian, a former World Champion. He was on a U.S. tour in 1982 and gave a simul at the Fitchburg (MA) Chess Club. I secured a ride to attend the event but we arrived 10 minutes too late to play. I watched Petrosian handily defeat over 30 players, including a few masters, then I got his autograph. 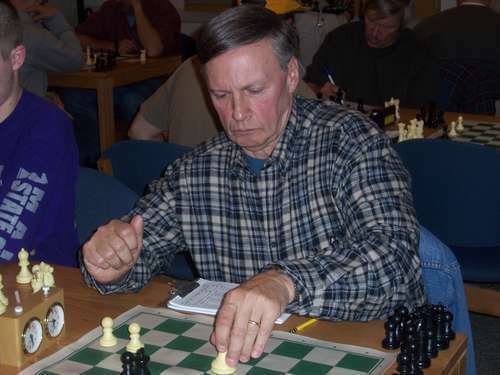 I played six-time U.S. Champion Walter Browne in a simul. IM Danny Kopec, who was teaching at UMO at the time, had invited Browne to come to the UMO club to give a lecture and simul. Another former U.S. Champion, Arnold Denker (Denker Tournament of Champions) stopped in once during a club tournament. I have Samuel Reshevsky's autograph as a result exchanged correspondence. Other notable players I have watched play in person are GM Patrick Wolfe (then a 14-year-old 2100 player), GM Ilya Gurevitch (as a 10-year-old 1700 player at the table next to mine). A few years later he became World Junior Champion. These players were at the Massachusetts State Championships. There was also John Curdo, winner of literally hundreds of tournaments in his career, playing IM Jim Rizzitano, a U.S. Chess Olympiad team member. CM: Having been in the chess arena for many decades you have certainly garnered much experience. What advice would you share with young players or anyone aspiring to improve their game? PC: First of all enjoy the experience! Do not get too caught up in your rating or trying to beat someone. Consistency in study and play, along with a lot of patience, will result in improvement. Do not get discouraged by losses. You will lose a lot, especially in the beginning. I think this is the toughest part for new players to overcome. I got distracted from continuing to improve because I had too many interests. If you want to really succeed in chess, or any endeavor, you have to be committed and persistent! CM: Do you have particular openings you favor with white and defenses with black? PC: I play d4 openings as white. Defenses are Tartakower against d4 and Sicilian Defense against e4. CM: Are there specific ways you go about studying the game? PC: Since the 80's my study has been inconsistent until recently. I am a visual learner so I prefer videos. There are many excellent DVD's available. YouTube offers a lot of instruction for someone of my level. You just have to be discerning because there is plenty of "junk" instruction, too. CM: What do you do off the board in your professional and family life? PC: I am a Plan Writer and Special Olympics Coordinator for MERT Enterprises, Inc. We provide support services for adults with intellectual disabilities. I have been a Special Olympics coach for 21 years and am a member of the planning group for Penobscot, Piscataquis, and Hancock County Area Special Olympics. My wife, Teri, and I have been together for 20 years. I have two grown daughters, Heather and Amee, and a son-in-law, Jim, who live in the greater Chicago area. We have three grandchildren, Tessa, Joey, and Noah. By September they will all be teenagers! Teri and I have a 130 pound St. Bernard mix, Beau, who tentatively negotiates around two cats! CM: In addition to playing chess, throughout your life you have been an accomplished athlete. Can you explain your athletic exploits and share how the competitive mindset of an athlete can be applied to chess competition? PC: I certainly did not start out looking like I would have any athletic success. As a young boy I was skinny, awkward, and shy! I began showing some promise in my mid-teens. My athletic heroes were Bob Mathias and Jim Thorpe so I explored a number of sports as opposed to specializing. I am still a big fan of the decathlon. I showed the most ability as a boxer when I was living in Cardiff, Wales caring for my grandmother. I had two trainers, a former pro and a former British Olympian. They were both encouraging about my prospects. I fought in exhibitions including one where I boxed three different opponents the same evening. When I returned to the U.S. there were not opportunities at that time to continue. The sports I competed in mostly were track and field, powerlifting, and bowling. In track I competed from high school through masters, doing running, jumping, and throwing events. Over the years I lifted in five different weight classes. At one time I was up to 236 lbs. ( I am half-Italian, liking food is not an issue!). I set a number of age-group records in those two sports. I reduced my weight considerably and ran road races for awhile. My best bowling score was a league game of 299 done in 2010. I accumulated well over 200 awards altogether. As far as mindset goes, the same principles apply to chess. It is important not to give up pursuing your dreams. You will have some people try to offer you what are really their own limitations, telling you that you can not succeed. Do not be discouraged by failures. The greatest players and athletes have all experienced them. Those experiences will only make the joy of your successes greater. Despite your best efforts you still may not attain your highest aspirations. One thing I can attest to, you will not grieve failure as much as you will not trying! CM: Is there anything you would like to add that we did not cover? PC: I will be spending a lot more time on studying and playing in hopes of regaining some of my former playing ability. Time will tell how that goes! CM: Thank you so much for the opportunity to get to know you a bit better. We wish you all the best in chess and life. PC: Thank you for asking me to do this interview! It was fun for me and I hope at least a little interesting to some of your readers. Best wishes to everyone! learn these things about Paul and that we had similar experiences along our chess career paths. These are things you never learn from the casual tournament meetings. It's possible Paul played in one of my Westford Chess Club tournaments, years ago, and I did not know him then.